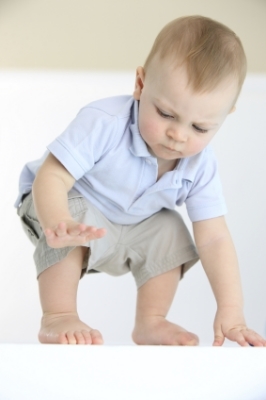 The fundamental movement patterns learned in infancy are referred to by various names: motor primitives, synergies, primal patterns, and developmental patterns. They can be thought of as neural control programs that can be combined in various ways to generate a large repertoire of movements. In this sense, movement is like a language. The basic motor patterns are like letters or simple words that can be combined to form more complex sentences. In spoken language, we can communicate an infinite variety of thoughts from relatively few words. Similarly, the complex and varied movements we see in sport and dance can all be broken down into far fewer basic movement patterns - gait, squats, reaches, rotations, etc. An arabesque in dance looks pretty similar to the backswing of a free kick in soccer because they are built from the same basic motor primitives. This combinatorial system makes the formation of complex structures simpler in terms of neural control. If we had to remember a different word for each thought we could think, our brain would be overwhelmed with the difficulty of storing and retrieving the right word for the right thought. It is far easier to remember a limited amount of words and then combine them. And so it is with movement. It is simpler for the nervous system to rely on a small number of general movement patterns that can be assembled together to form more complex movements. The muscle synergies involved in creating these patterns constrain degrees of freedom and movement options in a way that makes movement easier to organize. One implication of this system is that when a foundational building block is missing or compromised, the entire structure built on top will suffer. If you are missing some very basic words or letters in your language vocabulary, there are many sentences that you will struggle to make. Similarly, if your movement vocabulary is missing one or more important motor primitives, like a squat, there are very wide range of everyday movements that will be compromised. Conversely, if you improve your squat, you will improve many other aspects of your physical life. In the next couple posts, I'll discuss two ways to recover and improve developmental patterns of movement: (1) movements done in developmental positions like quadruped and oblique sitting; and (2) movements done with heavy resistance, such as deadlifts, squats, pushes and pulls. Although each method seems quite different, they have a critical factor in common: each constrains movement choices in a way that encourages the use of ideal developmental patterns, and discourages the use of movement patterns that are highly specific to the task and probably useless in other contexts.